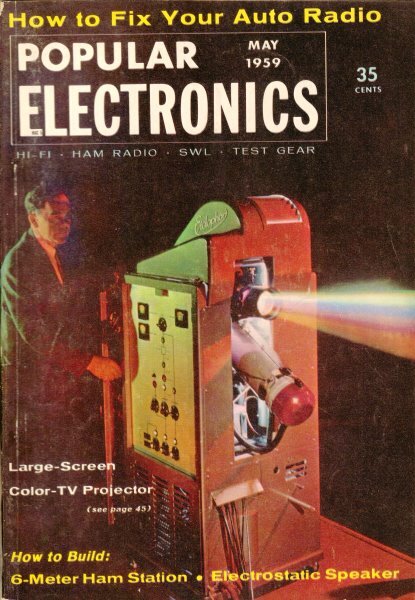 We are solidly in the middle of baseball season in America, so this "Carl & Jerry" story from a 1950 edition of Popular Electronics comes at a good time. As is the case with many "Carl & Jerry" episodes, this one involves the use of an amateur radio rig. Find out how and why Jerry willingly commits "Baseball Interference" (BBI) to beat the opposing team at their own game. The bat met the ball with a thud and sent it almost straight up into the air. Jerry tore off his catcher's mask and ran around in a little circle as his eyes searched wildly for the ball against the bright blue sky. Just in time he spotted it and stepped forward to catch it neatly in the deep pocket of his mitt for a third out. 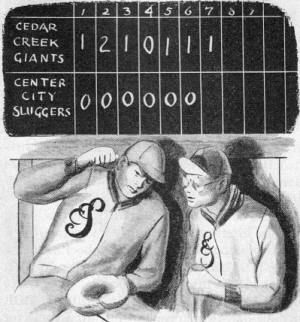 His pal, Carl, stepped off the pitcher's mound and trudged wearily toward the Center City bench while the Cedar Creek Giants ran happily out onto the diamond. They had something to be happy about. The score board announced it was the last of the seventh inning and that the Cedar Creek Giants had seven runs. Chalked up opposite the Center City Sluggers was a series of big fat goose eggs. Jerry struggled out of his chest protector and sat down on the bench beside Carl. "I just don't get it!" he said as he angrily drove his fist into his catcher's mitt. "They're not that much better than we are." "It's not who wins that counts; it's how you play the game!" Carl chanted. "Yeah, I know; but that's the trouble with being a good sport. You've got to lose to prove you are one. I'd like to demonstrate what gracious winners we can be." "I'm with you! What really bugs me is the way they seem to know every move we're going to make. They seem to know what kind of ball I'm going to pitch, when I'm going to try to catch a runner off base, and exactly who is supposed to take a high fly. It's spooky in a sandlot team that doesn't get any more practice than we do." "Maybe they're hep to my signals, but I'm doggone careful to conceal them from anyone on their bench. 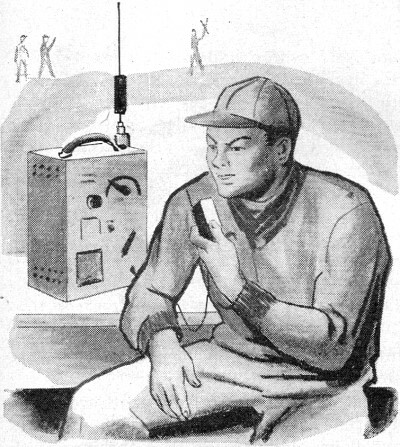 Do you suppose -" He was interrupted by Kent, the youngest member of their amateur radio club. This fourteen-year-old boy ate, drank, and slept radio. It was typical that he was tugging at Jerry's elbow with one hand and clutching a two-meter transceiver in the other. "Hey, Jerry, listen to this!" "Some other time, Kent," Jerry said impatiently as he shrugged off the "child" - who was a whole two years younger! "We've got a problem now." "I know you have. That's why I want you to listen!" Kent insisted as he jigged up and down in his impatience. At this moment the Center City batter hit a high fly out into right center field. A faint voice came from the speaker of the transceiver: "Let Murphy have it, Jonesy. Take it Murph." Both the center-fielder and the right-fielder had been running toward the ball, but as the voice spoke the center-fielder stopped and let the right-fielder make an easy catch for a first out. "Let me have that thing!" Jerry commanded. As the three of them listened intently, they could hear the same voice giving instructions to the pitcher: "This guy is a sucker for a slow ball. Try one. Thaaat's fine. Now he's crowding the plate. Put one over the inside corner and scare him back a little." "See that guy sitting all by himself out at the edge of the trees in center field?" Kent asked. "He's the bird doing the talking. When I get close to him, the signal really booms in. His transmitter is pretty low-powered, for the signal falls off rapidly as you get away from the diamond. Jerry, he's been relaying to the batter every signal you gave to Carl." Listening for the next few minutes revealed that the Giants didn't just seem to know what the Sluggers were going to do next. They knew! It was apparent that each member of the team had some sort of miniature receiver - doubtless transistorized - concealed in his cap. A bone-conduction earphone attached to the skull enabled them to hear every word spoken by the sharp-eyed observer who was equipped with a miniature transmitter and a pair of high-powered binoculars. 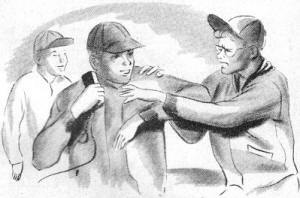 What's more, this observer knew the Sluggers' signals better than they knew them themselves! "Why the dirty so-and-so's!" Carl exclaimed. "Here! Give me that transceiver microphone and let me tell them off." "Hold on!" Jerry objected. "Maybe, if they don't know we're on to their electronic caper, we can turn it to our advantage. First off, we've got to cross up their intercepting my signals to you. We don't have time to make up a whole new set of signals, but suppose we do this: I'll make an ordinary signal that you can disregard; but then I'll wiggle my mitt up and down in Morse code. You know the way we send silent code in study hall just by tapping an imaginary key with our fingers. It will be the same except you will see me punching an imaginary key with the mitt. We can use initials. 'IC' will mean 'inside curve;' "FB' will be 'fast ball;' 'W' will mean 'walk;' etc. Usually the false hand signal will be just the opposite of the real code signal. Dig me?" "Yeah, I dig you; but it sounds pretty tricky. I'll have to study it out as we go along. I'm going to be a very deliberate pitcher from here on in." "Fine! Now let's pass the word along to the rest of the team." When the other boys learned about the electronic skullduggery afoot, they were properly indignant. This resentment actually worked to their advantage. Still seething, they stepped up to the plate one after another and angrily drove out solid hits. When the inning was over, the score stood 7 to 4. And the first half of the eighth was a far different story from what the other innings had been. 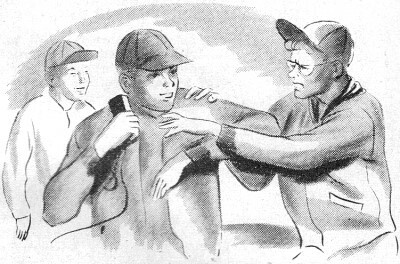 Jerry made sure the man with the binoculars got a good look at his false signal to Carl; then he casually called for the pitch he wanted by moving his mitt up and down. The effect was much more puzzling to the batter than if he had simply been allowed to go on his own. It was very disconcerting to be expecting a slow ball and then have one cross the plate like a rifle bullet. The net result of the double double-cross was three up and three down. The Giants never got a man on base. During the last of the eighth the Sluggers picked up two more runs, making the score 7 to 6. Jerry spent every minute with his ear glued to the speaker of the transceiver trying to figure out a way to turn the Giants' trickery to the Sluggers' advantage; but no opportunity presented itself. The first of the ninth was a repetition of the first of the previous inning: three up and three down. But fickle luck once more turned against the Sluggers as they came to bat. The first man up never touched the ball as three strikes were called on him in quick succession. The next man up drove a hot grounder to the shortstop that was rifted across to cut off the runner at first with seconds to spare. The third man, though, did barely manage to get on first with a drive just over the second baseman's head. It was Carl's turn to bat. Carl was far and away the best hitter the Sluggers had, and at first it seemed that the pitcher intended to walk him. The first two pitches were wide of the plate. But the third drilled straight across the center to land in the catcher's mitt with a solid smack for a called strike. Jerry could see Carl's hands tightening on the bat handle as the pitcher started his wind-up, but once more the ball was wide of the plate. The next one was too close to let pass, and Carl swung at it. His bat nicked the ball, but that was all. "Stri-i-i-ke Two!" the umpire cried as he held up three fingers on one hand and two on the other. Carl pounded the plate savagely with his bat and tensed his lean body. The pitcher started a slow windup and then uncoiled to speed the ball straight across the rubber. It was now or never! Carl swung with all his might and there was a solid crack of wood meeting horsehide. But a groan arose from the Sluggers' bench as they saw the hard-hit ball sailing too high in the air as it went toward a point midway between the stations of the right-fielder and the center-fielder. Both men started running toward it with their eyes on the ball. "You take it, Jonesy. Let him have it, Murph," Jerry heard the voice saying in the speaker of the transceiver. In a flash Jerry pushed down the transmit switch on the transceiver and said loudly into the microphone: "No, you take it, Murph; you're closer. On second thought, you better get it after all, Jonesy." 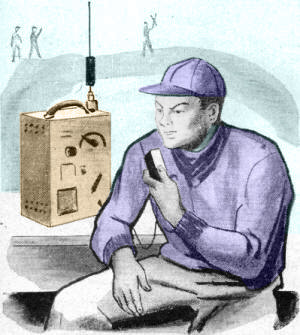 He left the transmit-receive switch in the transmit position to block out the signal from the other transmitter and watched in fascination as the two outfielders hesitated a second, then went charging toward each other with their gloves out­stretched. They came together with a crashing shock and then bounced apart to fall flat on their backs as the untouched ball bounced lazily along the ground. It was several seconds before the two stunned boys rolled over and got painfully to their feet. In the meantime Carl had loped around the bases in hot pursuit of the other runner, and the game was over. The Sluggers dashed out of their dugout to thump Carl on the back, but Jerry hung back to watch the man out at the edge of the trees. The two injured outfielders stalked over and towered threateningly over him as the rest of the Giants joined them. The man sitting on the ground waved his arms wildly and shook his head vigorously from side to side; but what he was saying seemed to carry little weight with the members of the team. As Carl and Jerry helped load the equipment into the back of the manager's station wagon, they grinned happily at each other. Winning the game was nice, of course; but winning it by outsmarting the tricky Giants at their own game - and doing it electronically-indeed made their cup runneth over. "I'll bet that's the last time the Giants use that gadget," Carl said as he glanced across to the angry huddle at the edge of the trees. "You can say that again," Jerry agreed. "And I was just thinking we've invented a new kind of interference. I've been accused of BCI, or broadcast interference; and TVI, or television interference; and I didn't like it a bit. But how I know I'm guilty of BBI, or baseball interference; and all I feel is a kind of warm, contented glow!"